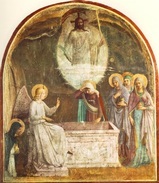 Mary of Magdala finds that the stone has been removed from Jesus' tomb. Thomas believes because he sees Jesus. Jesus appears to his disciples at the shore and shares a meal with them. Jesus gives his disciples a new commandment: love one another. Jesus is taken to heaven. Note: See Ascension of the Lord if it is celebrated today. Jesus appears to his disciples and gives them the gift of the Holy Spirit.